In 1800, travellers heading west from London would pass the growing town of Mayfair, with a long row of grand houses on the north side of Piccadilly down the hill. They would have passed the house that would eventually become Number One London, the future home of the Duke of Wellington, who redeveloped the original house in the 1830’s. The neighbouring houses would in time be demolished to allow for the construction of Park Lane. Wellington Arch was not moved from its original position in front of Buckingham Palace to its present position astride Constitutional Hill until 1882. Buckingham Palace was in Royal hands and remodelling started there in 1762, but more drastic work would come later with George IV and William IV. Notwithstanding these future events, the westward spread of London was well established. The development of Mayfair and St James from the 1770’s onwards was followed by that of Hans Town, from 1777, from Knightsbridge southwards, even though drainage problems in Belgravia limited development there the large mansions around Belgrave Square were not completed until 1840. 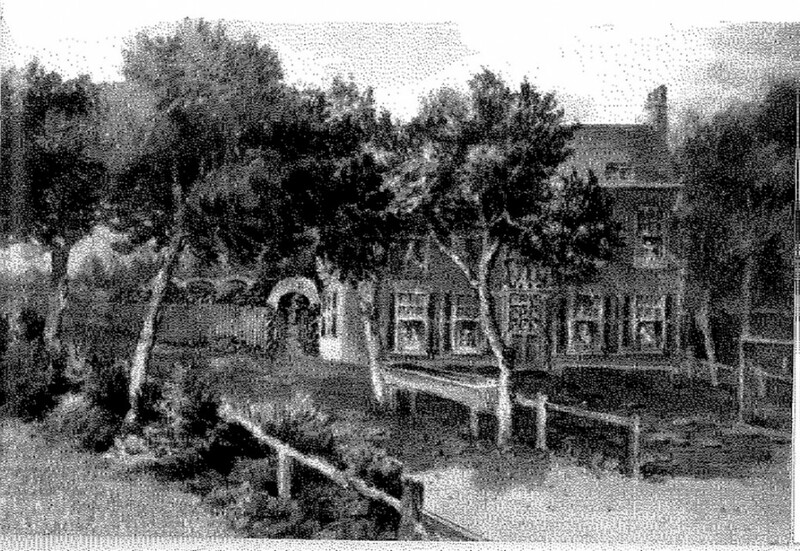 As our 1800 travellers proceeded west along Brompton Lane towards the village of Brompton, the first notable landmark would be the Bell and Horns Inn, shown below, located at what is now Empire House, and once one of the major staging points for people coming to London from the West. Here the road split, turning to the left towards Chelsea on the banks of the Thames (the current Brompton Road and Fulham Road) to the south and heading straight on towards the village (the current Thurloe Place), with its two public houses, The Hoop and Toy, and the Zetland Arms, both still in existence. The area was still very rural, known for its salubrious air and nursery gardens, with relatively few buildings and many green open spaces and gardens. Brompton Park, where the Victoria and Albert Museum is now located, was occupied by the celebrated Henry Wise, gardener to Queen Anne. By the end of the 17th Century, the majority of the land around Brompton was owned by two estates, by far the largest of which was the Smith’s Charity Trust. Henry Smith (1548-1628) had made his fortune as a city merchant, but died childless, leaving his wealth in a charitable trust. Either in his lifetime or subsequently through the actions of his Trustees, the Trust amassed a large property portfolio, including an 85 acre holding across Kensington, Chelsea and Westminster. Near Brompton, it owned the areas now covered by the Egertons, the Pelhams and Onslow Gardens. The land was let off, in large blocks to nurserymen, then the principal agricultural activity in the area. The second major family landowner was the Thurloe family, which came to historical prominence through John Thurloe (1616-1668), Secretary of State to Oliver Cromwell. This block covered the area now occupied by Alexander and Thurloe Squares, but extended to the west of the village of Brompton. Some of these lands were also let off to nurserymen. 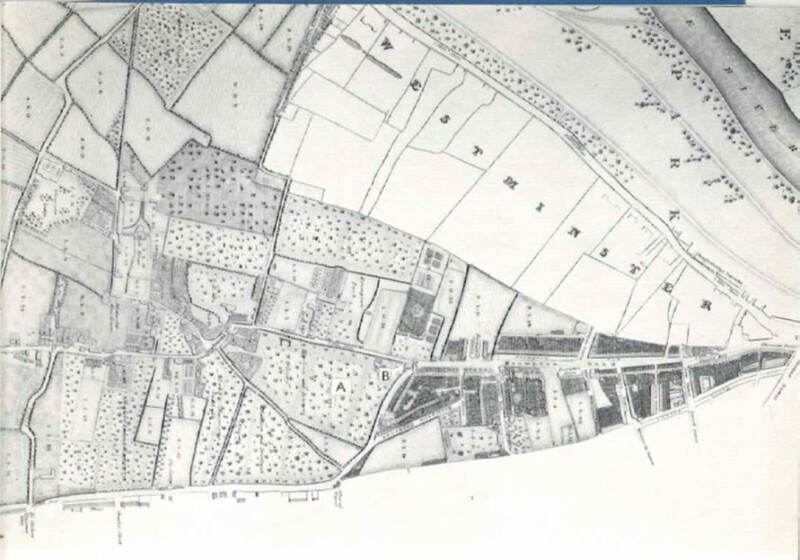 The map below shows the extent of development along Brompton Lane in 1822. Two important events influenced the development of the area around Brompton as the 17th Century drew to a close. Firstly, the Royal presence at Kensington Palace was still very strong, notwithstanding some decline after the death of George II, this only being reversed by the birth of the future Queen Victoria there in 1820. Secondly, the ribbon development along the Brompton Lane had started to encroach on the lands of the Smith’s Charity Trust. The area of Brompton was the next obvious step in the journey westwards. The end of the Napoleonic War in 1815 saw a period of unprecedented housing development. The fact that the major part of this area was owned by a few large estates had a profound effect on the way that it was developed. There was, and still remains, a unity of design throughout the area with a consistent layout of terraces, squares and crescents. In contrast, the area to the north-east, towards Hyde Park Corner, where land was held in small parcels and where, by 1820, development was already advanced, presents a much more diverse and peicemeal appearance. The architect, who had the greatest impact on development was George Basevi (1794-1845), who trained under the classicist John Soane between 1810 and 1816, before travelling widely across southern Europe. His best known building is the Fitzwilliam Museum in Cambridge, built between 1836 and 1845, and he was closely involved in the development and individual house design of Thomas Cubitt’s plan for Belgrave Square, which was started in the late 1820’s. At this time, owners often leased their land to independent developers to put up houses, which were then sold off on long leases. The most notable and successful developer was James Bonnin who, after a enjoying an extended period of success across the area, eventually failed in 1847. Following a building agreement between James Bonnin and John Alexander (1762 – 1831), an indirect descendent of John Thurloe, building started with the development of Alexander Square, North Terrace, Alexander Place (or, Alfred Place, as it was known at the time) and South Terrace (South Street), being completed in 1833. The Bell and Horns Inn that had been purchased by the Alexander Estate in 1808 was left in place but the area immediately adjacent was incorporated into this phase. Alexander House, with its grand pedimented façade, at the western end of North Terrace, was started as the Western Grammar School in 1835, although the original school room at the back was demolished to make way for Amberwood House a century later. The second phase started by Henry Brown Alexander (d.1881), John Alexander’s son, in 1840 with the building of Thurloe Square, with its large central communal garden, and connections to South Street and Alfred Place. Reflecting the growing wealth of the age and the increasing attractiveness of the area to well-to-do families, the houses in this phase were larger, grander and more flamboyant, with greater use of stucco. The doors of the houses in the Square were based on those of the Pantheon in Rome. Thurloe Place and Thurloe Street (then called Alfred Place West) was completed in 1848. The Great Exhibition of 1851, the brainchild of the energetic Prince Albert, who wished to create an area for public enlightenment, heralded the development to the north with the erection of museums and institutions of art and science. The area became known as ‘Albertopolis’, and over time a number of institutions would be built to fulfil his dream, although he failed to live long enough to see many of them, dying in 1861. The South Kensington Museum was established in 1857, using an extended Brompton Park House, which was eventually replaced by the current building in 1899, opened by Queen Victoria. This was her last official public engagement before her death, and the museum was appropriately renamed at the time as the ‘Victoria and Albert Museum’. The Albert Hall was opened in 1871 and the Natural History Museum, designed by Alfred Waterhouse, was opened in 1880. These developments led to the construction of three major roads; Cromwell Road, which now became the principal road to the west, thereby by-passing the village of Brompton; Exhibition Road and Prince Albert’s Road (or Queensgate, as it is now known). The area between the village of Brompton and the new Cromwell Road was developed as a third phase, with the completion of Cromwell Place and Cromwell Road, principally by 1863. These later houses were even larger and grander than those built in the second phase, although road widening at a later date heavily compromised their front gardens. The estate, therefore, was completed over a thirty year period between 1833 and 1863 and the footprint has essentially remained the same since, except for one major change. This was brought about by the building of South Kensington Underground Station from 1864, when the south-western corner of Thurloe Square, the houses to the south of Alfred Place West (and the mews houses behind), and the houses on the north side of Pelham Street were all compulsorily purchased and mostly demolished. Nos. 1 to 5 Thurloe Square were replaced by the present red brick block of Artists’ studios in the 1880’s with No 52 Thurloe Square being rebuilt in 1888. The freeholds of those houses, that were not demolished, were sold off at a later date. The impact of these purchases from the Alexander Estate meant that, when the terms of the current Estate Management Scheme were drawn up in the 1990’s, these houses were excluded from the Scheme. After this railway work, no development work was undertaken on the Alexander Estate until the first decade of the twentieth century, when the north side of North Terrace, the then-named Alexander Place, facing onto Thurloe Place, the old Bell and Horns Inn and the few cottages built in the 1830’s, were demolished to be replaced by Empire House, Dalmeny House and the Rembrandt Hotel over an extended time, with Dalmeny House only being completed in 1927. Thurloe Close was developed in 1928. Amberwood House and 2 Alexander Place were also completed in the inter-war years. Development continued in surrounding streets. Basevi was employed by the Smith’s Charity Trust to develop the Pelhams, completed in 1844, and work started on Brompton Crescent, soon to be renamed Egerton Crescent, and the southern end of Egerton Terrace. Work then spread along the north side of the Fulham Road with the development of Sydney Street (1845), Onslow Square (1847) and Sumner Place (1852). Walton Street was opened up in 1846. To the northeast, the area opposite Brompton Square was demolished in 1840, after various speculators had run into financial difficulties. This took some time and the current buildings were not completed until 1890, in a very different style and material from the rest of the neighbourhood. Holy Trinity Brompton was built in 1829, and some of their land was sold to Cardinal Newman in 1852 to allow the building of Brompton Oratory, in the Italian Renaissance style, eventually opening in 1884. More recently, the mansion blocks of Crompton Court, St. George’s Court, Malvern Court and Melton Court were developed in the 1930’s, replacing earlier housing. The history of the Alexander Estate is documented in Volume XLI of the Survey of London – Southern Kensington: Brompton, Chapter V . This includes interesting historical maps and photographs, detailed descriptions of the buildings and some excellent drawings of architectural detail. The book can be found in RBKC’s two public libraries and the chapters relating to the area may also be consulted at SKE’s office.